Fairborn’s Shaunn Monroe (3) goes in for a score against Miamisburg sophomore Luke Copsey, in the first half of Tuesday’s Feb. 12 boys high school basketball game at the Baker Memorial Fieldhouse in Fairborn. Monroe led all scorers with 27 points in the loss to the Vikings. Fairborn senior Jared Bates gets a throw past Miamisburg’s Brett Hensley to fellow Skyhawks senior Tylen Eatmon, during the first half Feb. 12 at the Baker Memorial Fieldhouse. Skyhawk senior Tylen Eatmon (2) steals and scores in the first half of a 58-45 home loss Feb. 12 to Miamisburg. 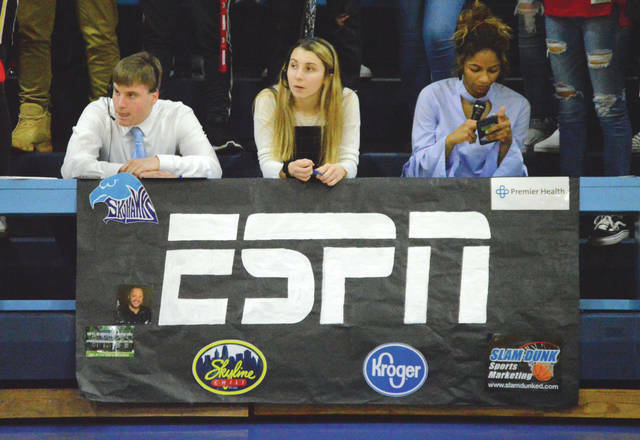 An ESPN television crew was spotted at Tuesday’s Fairborn-Miamisburg game, but there were no cameramen. Fairborn’s student section had fun anyhow, despite the home loss to Miamisburg. 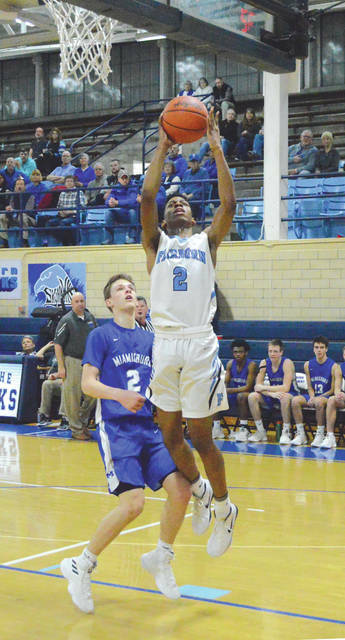 FAIRBORN — Visiting Miamisburg slowed down speedy Fairborn, and the change in pace disrupted the host Skyhawks enough to give them troubles, in a 58-45 Vikings win Feb. 12 at the Baker Memorial Fieldhouse. On Senior Night, Shaunn Monroe turned in a game-high 27-point effort to get over his scoring average, and fellow seniors O.J. 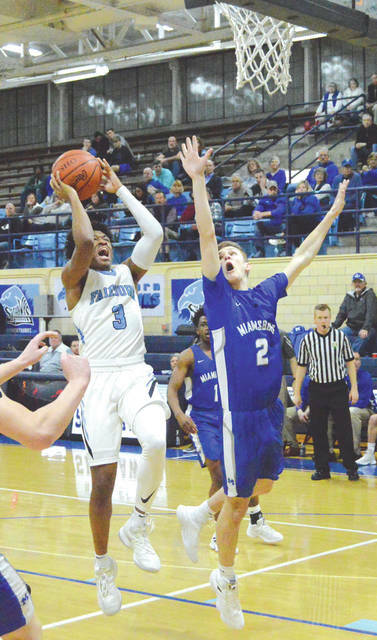 Person and Tylen Eatmon scored eight points each to go percentage points over their averages as well, but seven other Fairborn players were held scoreless. Skyhawks coach Billy Harchick said the difference came down to height and numbers. Harchick doubted whether Bodekor would be ready to play in Friday’s 7:30 p.m. Feb. 15 regular season finale at Xenia, but hoped to have the talented 6-5 senior forward back in time for the sectional postseason tournament. Eighth-seeded Fairborn (13-8, and second in the Greater Western Ohio Conference’s American South at 10-4) will take on No. 11 Springboro in the opening round of the Division I sectional tourney at 6:30 p.m. Saturday, Feb. 23 at Vandalia’s Butler High School. Miamisburg (15-6, 5-5 and tied for the GWOC National West with Lebanon) had at least two “bigs” — 6-6 senior center Duncan Hall and 6-3 senor forward Drew Barry. 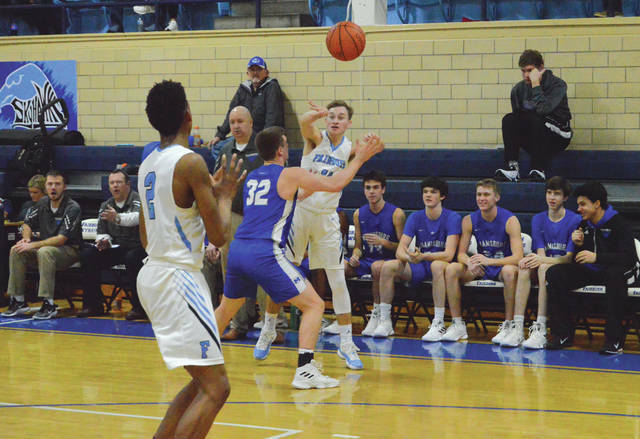 Add in the Vikings’ leading scorer, 6-1 senior guard Brett Hensley, and Fairborn’s size disadvantage soon became apparent. Hensley, who leads the Vikes with a 12.2 points-per-game average, led Miamisburg with 16 points, Hall finished with 12 points and at least 13 rebounds, Corey Hartman also had 12 points, Barry wound up with 10 points and Alex Ball scored eight. Fairborn tried to mount yet another comeback this season. The Skyhawks have trailed at halftime in six of their wins this season. Down 28-19 at the break this time, Fairborn’s Monroe and Eatmon teamed up to lead the Skyhawks on a quick 6-0 run to start the second half, and draw within three points of the lead at 25-28. But a Barry 3-pointer with just over 40 seconds left in the third quarter gave the Vikings a double-digit lead, 41-30. Up 41-32 with one quarter yet to play, Miamisburg outscored Fairborn by a 17-13 margin in the fourth quarter to pull away. Harchick credited sophomore Cole Spencer and senior O.J. Person with a strong determined effort against Miamisburg’s ‘Bigs,’ and made sure to thank the Skyhawks’ other seniors — Monroe, Eatmon, Joe Nickel, Jared Bates and Bodekor — for the effort they’d put in all season long. “They’ve done a great job for us all year,” he said.